Which of these photos shows permeable interlocking concrete paving? Both! A concrete grid system (left) was once the only permeable option. As municipalities have increased pressure on developers to minimize storm water runoff, a number of attractive permeable pavers like Permea (right) have come on the market. These concrete pavers look like cobblestone, brick, or traditional pavers, but spacers allow water to flow between them, when filled with a fine, clean aggregate. This short ICPI video presents more detail on the benefits, performance, and applications of permeable pavers. 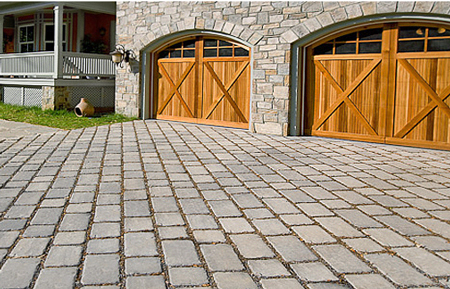 This peastone driveway is dressed up by a granite cobble apron. We used a new product, a polymeric stone dust, in the joints of the cobbles. I’m very happy with how it is holding up after the winter, with no wash-out that we would see in such wide joints filled only with stone dust. The whole drive is permeable, making it a great option for sites needing to offset the impervious area of an addition or new home construction. Permeable paving and use of natural, local, and recycled materials may qualify for LEED/Sustainable Sites credits. The traditional New England materials are also a perfect match for historic architectural styles.